Our story opens where countless stories have ended in the last twenty-seven years: with an idiot - in this case, Rebecca Atherton, head of the After the End Times Irwins, winner of the Golden Steve-o Award for valor in the face of the undead - deciding it would be a good idea to go out and poke a zombie with a stick to see what happens. 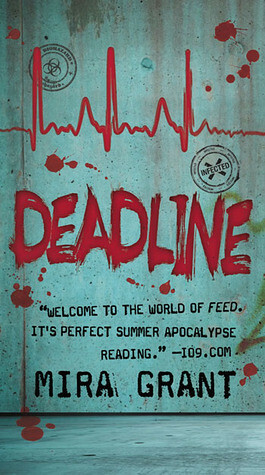 Feed was told from the point of view of Georgie Mason, head of the After the End Times blogging site. She was a newsie, interested in facts and uncovering the truth. Now her brother Shaun Mason takes centre stage. He is an Irwin, yes, named after Steve Irwin, that’s a news reporter who is more interested in the action rather than the hidden truth. I really loved the first book in this series, and in many ways this one was just as good, but unfortunately it gets a little too much into the conspiracy theory territory. it just stretched believability just too far for me. While I was in the middle of reading the story I could go along with the story with no problems, it is well told and gripping, but whenever I’d stop reading for a while I’d feel myself going, nope, I just don’t buy that much of a conspiracy. However, it is still an awesome book, and I am eagerly awaiting book three, which isn’t out until next year, unfortunatly. And it may seem strange to compare this zombie/horror book to a tragedy like the shootings in Norway, but in a way this story is about terror, and how culture reacts to fear. Because the Newsflesh books aren’t really about zombies, they are about the life going on all around the zombies, and how fear of zombies has paralysed people. Of course, the books are more about the culture of fear that has grown up as a reaction to the terrorist actions in the states, there are depictions of how much further the security precautions have progressed, but are we that far from those extremes today? And do they really do any good? I am curious about this series, but haven't read any of them yet. reading about the 1st book on your forum really got me curious, and it seems that with bk2 the author has quite a good thing going here. i like how its not about zombies per se, as you say, but about our response to this sort of thing. very interesting.